We want to help you bring our entire library directly to your users! Let us deliver the content, so that you can focus on building an amazing machine. Enter your email below and we'll be in touch. MyMiniFactory has built the best platform and community for 3D printable content! All models are tested through software as well as community test-printing, meaning that every object on the site is guaranteed 3D printable. This ensures that users don't waste time or filament trying to print bad files, and more importantly, they won't blame you as a manufacturer for not being able to print a non-printable file. Our private API is easy to use and you can see below some examples of implementation. We also offer the innovative Click & Print feature, meaning your 3D printer users don't even need to learn how to slice. If you have any questions or would like to integrate MyMiniFactory inside your slicer, please contact us at manufacturers@myminifactory.com. Printoid is the smartest interface for Octoprint servers. Controlling your 3D printer has never be as simple as now! When connected with the MyMiniFactory plugin for Octoprint, you can not only easily launch a print, but also monitor it in Printoid on your Android phone. This Octoprint plugin let you benefit from the innovative Click & Print feature with any printer connected to your Octoprint instance. No more file preparation and slicing, with Click & Print, you can start a print from your phone in seconds. Winner of the international Red Dot design award, Witbox Go! is the first printer with an Android OS. Zetup, the in-house software is easy to use and comes with free access to the MyMiniFactory object library. After years of designing and manufacturing desktop 3D printers, BIQU now brings a tool for Makers and Designers to bring their ideas to life. The BIQU Thunder packages best-in-class DIY 3D printer features, and adds a ton more, like auto-levelling and wireless connectivity. BIQU Thunder brings the workshop out of the workshop, powered by MyMiniFactory's Click & Print, allowing true 1-click 3D printing. Raisecloud allows Raise3d users to collaborate, pool resources and efficiently create 3D prints through every phase of development and production. Raise3D uses the MyMiniFactory API to allow users to easily 3D print high quality objects, and deliver a great experience. With the Snapmakerjs software and from version 2.4.2, the stunning creations of talented designers from all around the world are just a few clicks away, thanks to an easy-to-find link, directly in your 3-in-1 slicer. Cura for Dood is a modified version of Cura that comes with Dood Pro 2 settings and a direct link to download quality objects from MyMiniFactory. The 3D Creator app lets you save, view and edit your 3D objects. Capture your world in 3D, straight from your smartphone. Turn people and objects into high-resolution 3D avatars. Easily share and remix them through the MyMiniFactory Android app. Vectary is a free, browser based 3D design tool. Vectary users can import MyMiniFactory models directly into the software, as well as easily share their creations back to MyMiniFactory. SelfCAD is an online browser-based CAD/CAM platform which allows the user to model, sculpt, slice and print online. Designers can learn, create, and print objects in a fraction of the time required with traditional CAD/CAM software. SelfCAD users can import models from MyMiniFactory as well share their designs directly. 3D Slash is a voxel based 3D modelling software. Reminiscent of Minecraft, 3D Slash is a super accessible and fun design tool. Users can share their designs directly to MyMiniFactory. Get started in 3D printing with the amazing sub $100 STARTT 3D printer kit. 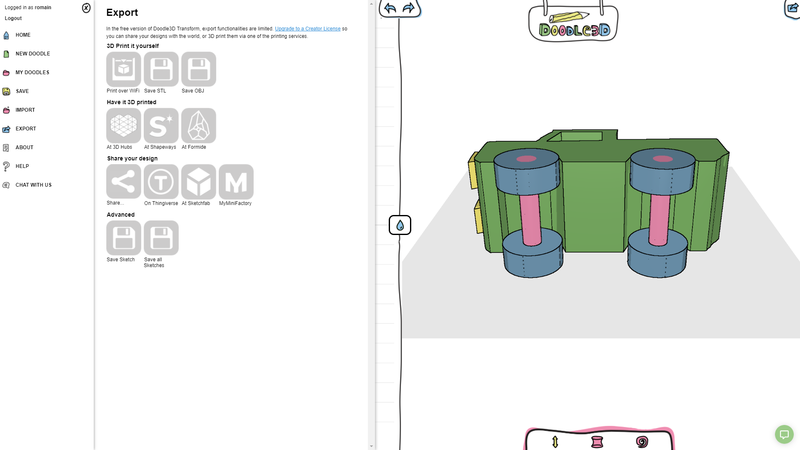 Build you own printer using our thorough and easy to follow guides and kickstart your journey in the 3D printing world. 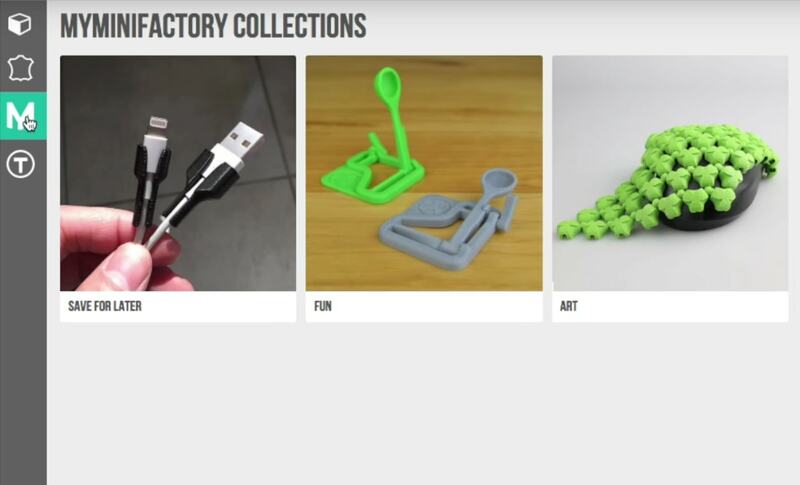 Explore, browse and download content from MyMiniFactory directly through AstroPrint. You can then plug into that cloud from anywhere, via desktop software, mobile apps, web browsers, you name it! Doodle3D Transform makes creating for the 3D world accessible and fun for everyone. No specific skills are required to start, so it’s perfect for children and designers who want to get started with 3D modelling and printing. Users of the upgraded Creator version can easily share their models from the Export menu. Printrbot is one of the most popular 3D printers in the world. 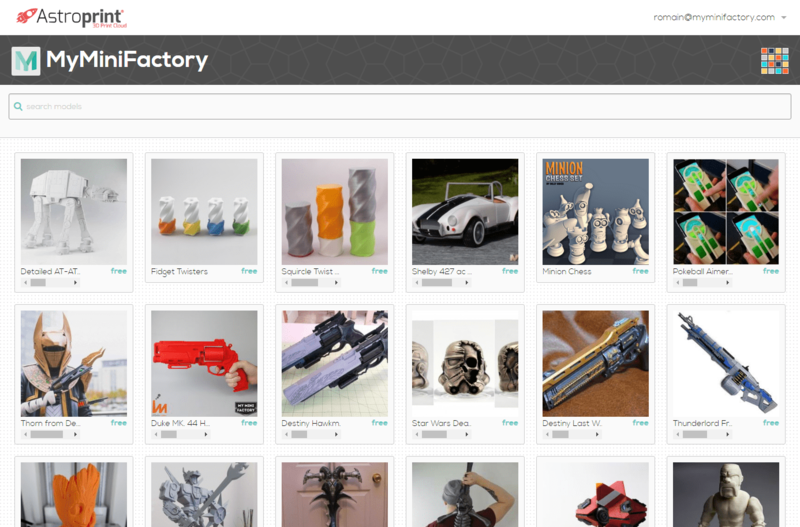 Now Printrbot users can access over 20k curated models from MyMiniFactory directly from the Printrbot Cloud. Watch the video for more information. The Cubicon Single provides user experience like no other 3D Printer. With it's fully automated bed leveling and convection temperature control function, perfect prints have never been so effortless. ZEUS is an integrated 3D scanner and 3D printer with an embedded touchscreen. Users can search thousands of free objects from MyMiniFactory and directly download, slice, and print without the need for a computer. This is Robox! Designed to be the simplest, most reliable and comprehensive 3D printing platform available. Packed with innovation. The Realvision software platform is a set of software and firmware applications designed to enable flexible and easy to use 3D printing.